Will The Upcoming NBA Season Give Us The Showtime Lakers 2.0? The days of Magic, Kareem and Big-Game James feel like ages ago to today’s modern NBA fans. While the prestigious Los Angeles Lakers have carried on winning championships even after their ‘Showtime’ days, many argue that the 80’s and 90’s can be considered the golden age of NBA basketball. Since then, Los Angeles has managed to field some very competitive teams, some mediocre teams, but rarely ever any bad ones. It can be argued, however, that since the 80’s, never have the Lakers had as hyped up a team as they do now with the additions of Steve Nash and Dwight Howard. With that in mind, let’s take a look at the current Lakers team and see if the upcoming NBA season will give us the Showtime Lakers 2.0. Really, the only thing that the Lakers could possibly add at this point is a backup small forward. But even that is nitpicking, especially considering that Antawn Jamison could easily step into that role, or the Lakers could run a small lineup with Kobe Bryant at the 3. On paper, there is no team in the West that can beat the Lakers in a seven-game series. Having a magician-like Nash running the point will almost assuredly relax any wrinkles that might emerge out of a lack of chemistry. Furthermore, Dwight Howard will anchor the Lakers defense as he did in Orlando and with even better defensive players surrounding him, the Lakers will become an elite defensive team very quickly. The reason why I compare these Lakers to the 80’s Showtime Lakers‘ squad though is not only due to their talent, but also due to the style of game they could potentially run. The days of Magic Johnson, Kareem Abdul-Jabbar and James Worthy were characterized by a smooth uptempo offensive while still playing solid defensive on their own end. The league has seen fast teams since those days, but few fast run-and-gun squads in the modern age play good defense too. The Showtime Lakers days were orchestrated by a great passer in Johnson and although Nash isn’t the all-round player that Magic was, he has equal playmaking abilities. Offensively, Howard will probably never be what Kareem was but to be fair, in the 80’s Kareem also wasn’t at his prime just yet. Then there is the fact that the Lakers still have Pau Gasol, who without a doubt is a better all-round player than A.C. Green. With that said, we still have not even discussed Kobe Bryant, arguably the second greatest shooting guard of all time. Worthy was a great player, but if you are making comparisons, Bryant beats him by a long shot. The upcoming NBA season will be quite interesting, to say the least. If the finals don’t feature Los Angeles and Miami I think the entire country will be surprised, and commissioner David Stern might even be a little irked. Other teams will continue to make changes to their rosters, but none will be able to make a splash as great as the Lakers. 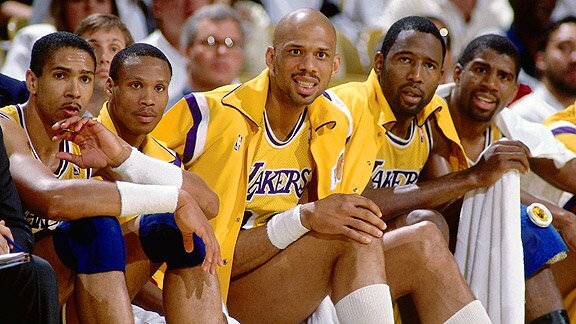 The upcoming 2012-2013 season will be one to behold for many reasons, but most of all, for the fact that we may witness the re-appearance of the Showtime Lakers. Excited for the Showtime Lakers? Let us know what you think in the comments below.